Hi! I’m Jules Clancy, a former food scientist turned cookbook author and real food lover. What Makes Stonesoup Recipes Different? 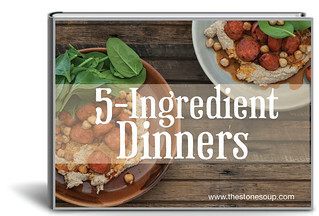 I only write recipes with 6-ingredients or less. One of my ‘super powers’ is being able to simplify recipes without sacrificing flavour or resorting to processed crap. My recipes also include ‘Variations & Substitutions‘ to suit your dietary requirements or missing ingredients. For more about me see my about page or my now page. + Download my FREE eCookbook! 2 Secrets to a Simple Kitchen. How to Simplify any Recipe. How to Stock a Simple Pantry. The Stonesoup Guide to Tasty Travel. Got a Suggestion for Blog Post on Stonesoup? NOTE: The information contained on this website does not negate the personal responsibility of the reader for their own health and safety. Please contact your healthcare or medical professional for individually tailored advice. The author is not liable for injuries or damages to any person or property as a result of following the information contained on this website.